Well, with the last thread now sent to the abyss....er, the Hall, I figure it's time to start off a new one. In the spirit of that I'm starting off the new one with some blank line art for people to color like the first thread was. In this case, it's my newly-finished VF-1 family featuring all four basic models, as well as a few tweaked details. Cockpit interiors, crew, and weapons will come in later upgrades. Great looking schematics. Some of the best of the VF-1. Well done! Version 2.0 - Went back and added a right side profile with logos. Also tweaked with color to give it a more true air force feel. 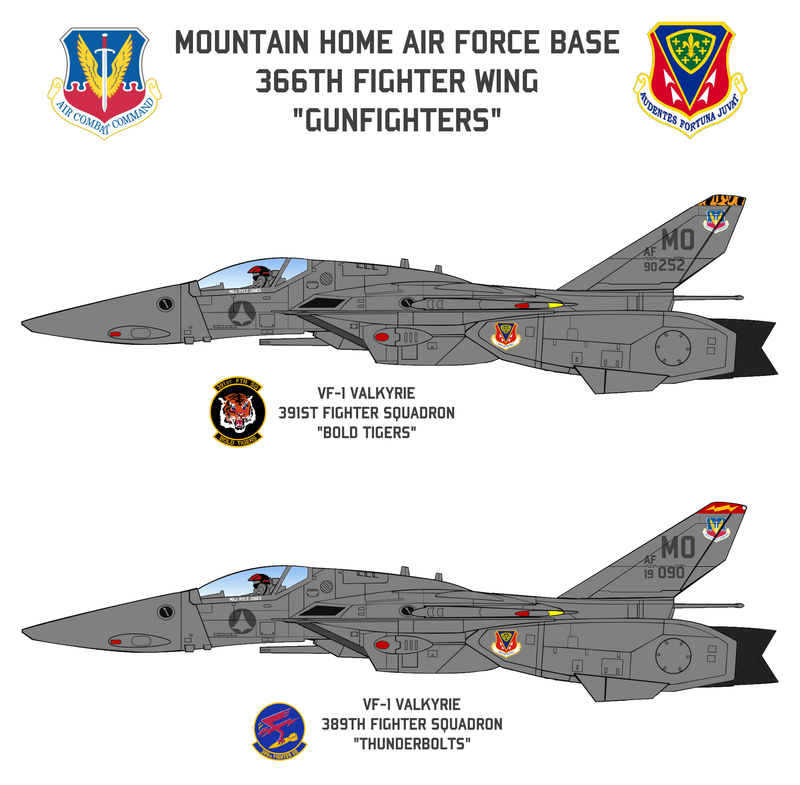 I know you wrote you weren't going to "focus on accurate color" but you do have the wing and squadron insignia swapped---since everything else is 100% "USAF standard" that aspect pops out at me. Should be wing badge on the starboard side, squadron on the port side. Yeah see every single picture I looked at for reference as to where the patches go on the plane, was different. Some planes had the Wing patch on the port side and the Squadron on the starboard side and vice versa so I wasnt really sure which one to follow. Even some of the tail markings were swapped in pictures I looked at so I just did my own thing. You found variations? I don't think I've ever seen a plane that was "wrong". I'd love to see a pic that was the other way. K well I cant find them now but I could have sworn that I saw some pictures where the patches were reversed. Maybe I was looking at them weird or something. Oh well, my bad. Talos' line art is really awesome, so I used it as the base for a shaded version like I saw in the last thread. The shading is taken from a VF-1 3D model I built a little over a year ago. Mine's not quite so accurate to the lineart so I had to do a lot of adjustment in Photoshop. Since I made A and S heads for my model those are the ones I've done. I don't have J or D versions. The thumbnails look a little weird for me, but the actual PNG files they load are fine. I hope the shaded versions are useful for folks. In theory you should be able to put color and insignia right over this like the ones from the last thread. 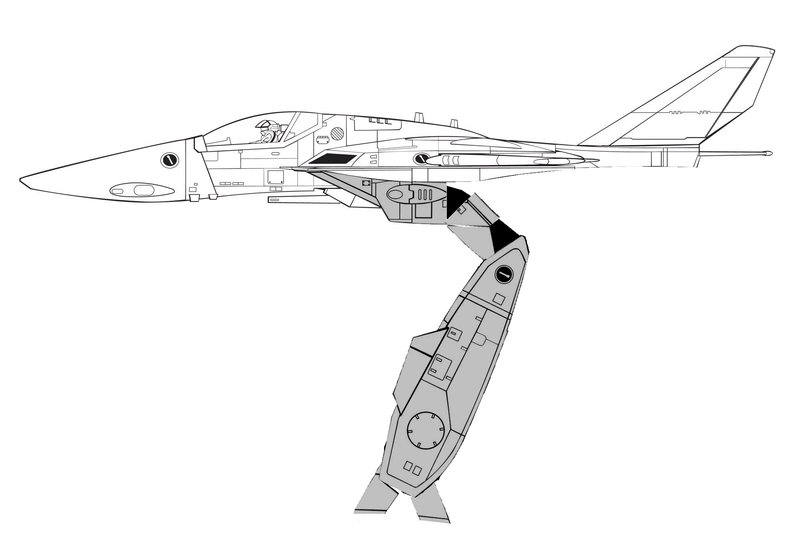 I just have to ask...where did that "broken leg" schematic of the VF-1 Valkyrie come from? I've seen that around for decades and always wondered who the heck came up with that. No, I think he is talking about the one that Horatio had, where the engine nacelles are tilted down a few degrees. I have a feeling it's based on an older model or figure of the plane, probably from a design limitation or something. 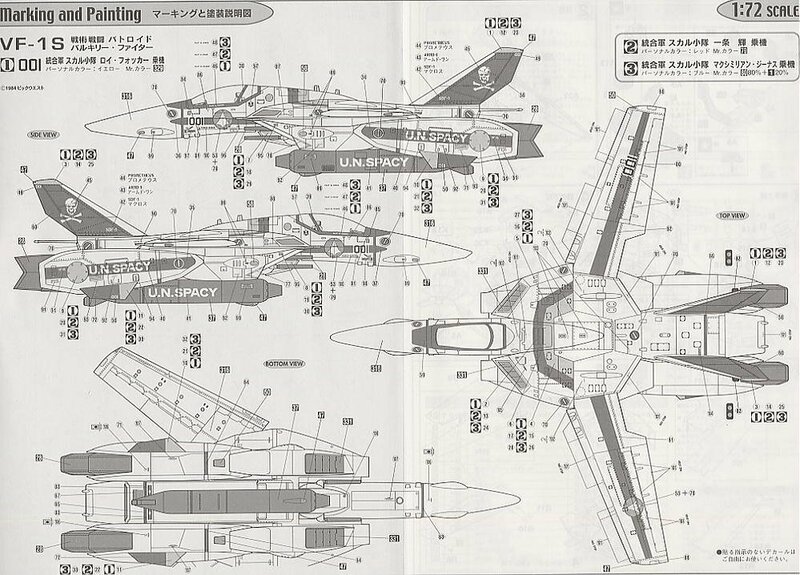 The Hasegawa 1/72 VF-1s have it too, you can see it in the scans on this website of their instruction booklets. Horatio, thanks for the compliment and awesome work on those planes! They look really good. I know my 3D model got it's tilted-downward leg from the Hasegawa model instructions I used as reference. The 1/44 scale Chara Works Valkyries are probably the worst case of it in toy form. Ah right. Now I remember. Thanks Talos and Horatio. 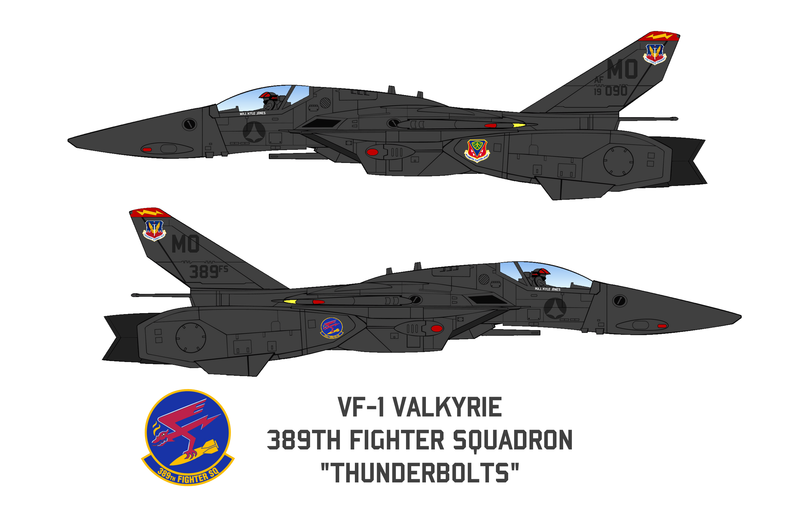 At the request of a few people, I started something I've had in the back of my head for awhile, the redo, accurizing, and detailing of the VF-4 lineart I used previously (which was a modified TIA: M+ one, quiet inaccurate and undetailed) using Kawamori's original lineart from FB2012. It's still unfinished, but I thought I would give people a peek. I don't intend to use it anytime soon, but I know at least one other person is. I have plenty of projects to keep me occupied instead, both Macross and otherwise. Only spent a few hours on this, but it doesn't look half bad, if you ask me. And, uh, thanks to March for the Macross Kite. Jacked it from the Macrosspedia. I seem to steal your stuff a lot, March. Oh, steal away. It's all for a creative cause Well done. I said I'd have my three cents out when I got back to school, and here it is. I am LOVING this VF-1, Talos. I may even try out that VF-4 of yours, now. Horatio: interesting! Any chance you might be willing to post some full renders of this model? Glad you like the VF-1. Let me finish the VF-4 first. You betcha, Talos. I'm well-enough at work with this Valkyrie to worry about the Lightning right now, anyway! Thanks! I posted a thread a while back, but this version has been tweaked more recently than the stuff in the thread. For my father, the VF-1J in DeafRocket livery. A preview of something I'm working on for Mr. March. Oh snarf, it's just what I've been needing lately, oddly enough. I can't wait to see that get done, Talos. Fantastic work Talos. This is gonna be a very welcome profile schematic. Good job! I should probably repost my VF-0s for people who don't have them from the old thread. VF-0A/B/C/D/S. Not exactly Macross, but still Kawamori! I colored this lineart up Mr. March-style. It's a Sugo GSX-NEO Vel Satis from Cyber Formula SIN. The two-tone grey is the canon scheme from the show, the others are me trying out different colors on it. Nice color work. Definitely a great car design by Kawamori. Thanks, March. I wouldn't have been able to do it without your getting me started. I redid my YF-21 and VF-22S line art and added a special custom one for Mr. March. I also did up a Virgin Road VF-1D color profile for M3 too. It's been a fun diversion to do some non-shaded, non-realistically-colored art. where i can find more templates of the vf 1s in differents modes and angles? With the new release of VF-19 Master File, I couldn't resist working on my VF-19s again. 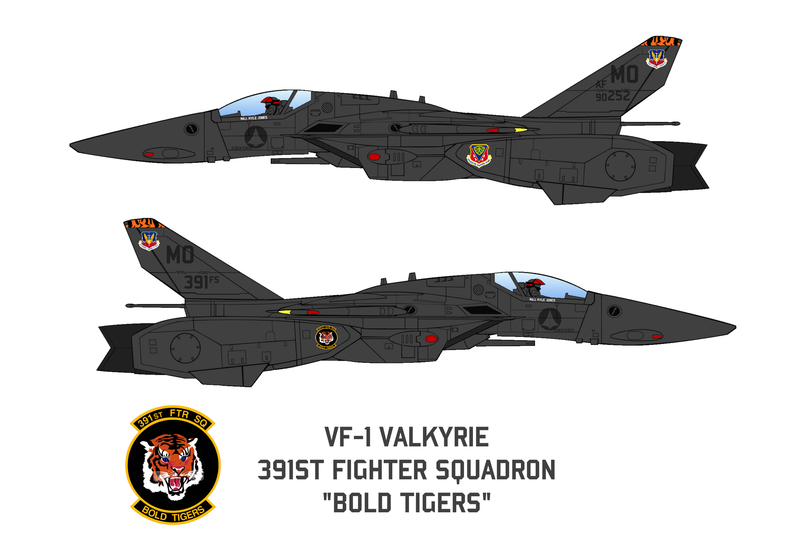 I'm taking some of the additional detailing that shows up in the VF-19MF images and adding it to the VF-19A I started last year. I'll do a new VF-19F/S from scratch as well.